USA Kilts is proud to support Scottish and Irish bagpipers all across the USA. If you are ready to invest in a new set of pipes we can help -- not just with selecting a maker, but also with kitting out the pipes of your choice with the best reeds, chanter, bag, etc. for your needs and playing style. See what we have to offer here. 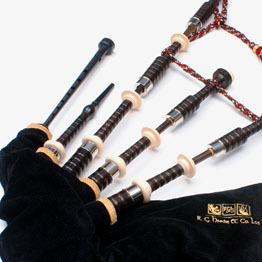 Where Can I Learn More About Bagpipes? Want to talk to someone who really knows their stuff? Ask for our on-staff bagpipe specialist, Lucas Mitsch. Lucas has been playing Scottish Highland bagpipes since he was twelve. An avid musician and music scholar, he actively composes and teaches private piping lessons here in the Philadephia area. Lucas has been an active member of the Washington Memorial Pipe Band since 2004 and holds the Level 3 Certificate in Piping from the Piping and Drumming Qualifications Board. Additionally, he has served as the Grade V pipe major during competition seasons. Lucas's solo performances include opening for The Tannahill Weavers and playing at the prestigious Kimmel Center (as well as the usual weddings, funerals, private concerts, formal dinners, etc.) Lucas's current instrumental studies have branched into the medieval realm with instruments such as the hurdy gurdy, rauschpfeife, and medieval German bagpipes. 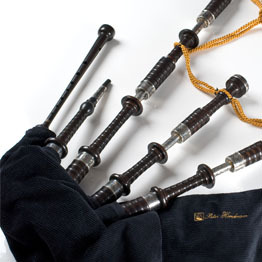 He owns and maintains over 20 different sets of bagpipes including Highland pipes, smallpipes and bellows pipes.